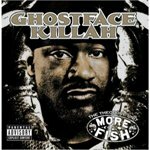 More Fish isn’t as much a follow-up to 2006’s acclaimed Fishscale as it is the sophomore album from Ghostface’s crew, Theodore Unit. Like their 2004 debut 718 to Somalia, this album is uneven. When Ghost passes the mike to them, the quality instantly falls off. There’s nothing wrong with Trife, Shawn Wigs or Cappadonna. They’re good-to-competent emcees, and Trife in particular has shown improvement over the years. But they ain’t Ghost. It isn’t that Ghost is the wittiest or most skilled rapper. He possesses these qualities, no doubt, but his appeal is largely emotional. When he ramps up his flow and pitches his voice during the tempo change in “You Know I’m No Good,” you feel the excitement, and an average song becomes a great one. There’s warmness, but there’s also desperation. Isolated, the lyrics of “Josephine” are a paint-by-the-numbers anti-crack testimonial, but the pleas to a noxious femme fatale sound immediate coming out of Ghost’s mouth. There aren’t any instances of his famous crying flow on More Fish — see “I Can’t Sleep” from Wu-Tang Clan’s The W for that — but the man always sounds on the verge of tears. And over grimy and leftfield productions by MF Doom (“Gunz N’ Razors”) and Madlib (“Block Rock”), the voice sounds both unhinged and perfect. This entry was posted in Reviews and tagged Ghostface Killah. Bookmark the permalink.